If you are walking along Cornhill, in the City of London, do look up when you get to the office building at numbers 54 and 55. Perched on the roof you will see a fine group of devils. 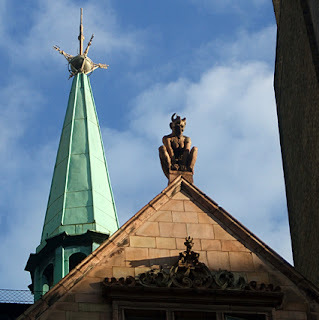 Most tourist guides say there are three Cornhill Devils - two large ones and a small one - but actually there are others hidden among the cornices and decorative features of the building. They are best described as gargoyles and the three main ones are made of terracotta, but no one knows exactly why they are there. One London legend has it that back in Victorian times, there was a disagreement between the architect Ernest Augustus Runtz, who was designing the office building, and the vicar of St Peter-upon-Cornhill, which is next door. The vicar said that the planned offices were slightly encroaching on Church land and forced the design to be changed to prevent it. In retaliation, the architect placed devils on the roof after the building was constructed, staring at the church, to get his own back. It is a good story, but might just be that.